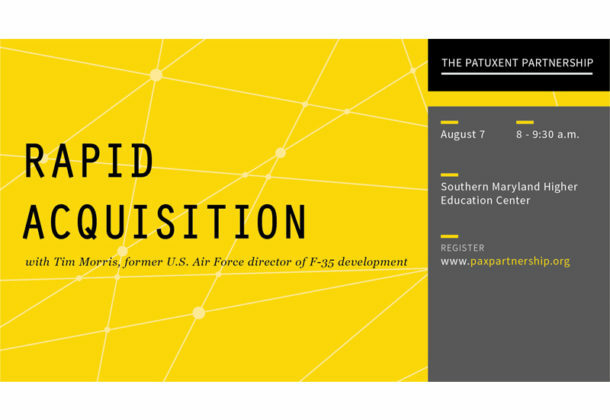 The Patuxent Partnership is hosting an informational event to teach about Rapid Acquisition from 8 to 9:30 am Tuesday, Aug. 7, 2018, at the Southern Maryland Higher Education Center at 44219 Airport Road in California, Md. Tim Morris, the former US Air Force director of F-35 development, will be the speaker. He will teach and discuss everything participants need to know about rapid acquisition. Mr. Morris plans to cover the topics of the reasons behind the big push for rapid acquisition, recent NDAA authorities and what they mean, plus current Department of Defense and Navy Section 804 implementation guidance. The rapid acquisition authority recommendation is used by the Department of Defense to quickly fulfill a Combatant Commander urgent operational need. The Secretary of Defense is able to invoked this special authority. There are many useful things to know about rapid acquisition that can make it easier to understand for defense contractors. For instance, it’s best if the orders are fulfilled using small changes to existing and mature technology or products, according to Rand.org. Also, the biggest key factor for rapid acquisitions is flexibility on the part of contractors, and the ability to make changes quickly when necessary. The speaker, Mr. Morris, is now manager of acquisition management for WBB Inc.
Dr. Dan Crippen and retired VADM Joseph Dyer will speak at an event at St. Mary’s College of Maryland from 6 to 8 pm Thursday, Sept. 6, 2018. The Patuxent Partnership and Center for Study of Democracy at St. Mary’s College of Maryland are pleased to present Dr. Crippen, who is on the board of directors of the Committee for a Responsible Federal Government; on the board of trustees of the Center for Health Care Strategies; former executive director of the National Governors Association (2011-2015); and former director of the Congressional Budget Office (1999 – 2003); and VADM Dyer, commissioner on Section 809 Panel, former chief strategy officer, chief operation officer, and president at iRobot Corp., and former commander of the Naval Air Systems Command. The Patuxent Partnership will also receive the St. Mary’s College of Maryland Trailblazer Award during the program. Advanced registration is requested to manage seating. There is no cost for this program.